White Knight Chronicles is an RPG series that's been on the receiving end of some mixed reactions. Some adore it while others don't really see the attraction. It's a relatively standard RPG experience, but boasts a pretty impressive online component. White Knight Chronicles: Origins doesn't quite stray too far from that description, but it does change things up a bit, opting for design choices fitting of a portable title. Set 10,000 years prior to the events of the original game, Origins tells the tale of a world in strife and two nations locked in what seems like an endless war, a war that comes to be known as the Dogma Wars. In a rather interesting plot twist, the main hero is not the White Knight. On the contrary, the Knights and the Yshrenian Empire are hellbent on become the dominant power in the world, with the Athwani Mage Kingdom being the only nation left that has the power to stop them. With Origins, you'll be able to create and customize your own hero, who you'll also be able to take online through the game's multiplayer mode. The adventure kicks off with a siege on Xarmgand, a strategic fortress belonging to the Athwani Mages "“ think of it as Rome's Constantinople. Unfortunately, the fortress falls to the overwhelming might of the Knights and that's where players find themselves. Right after the siege and waking from a coma, you join the Mobile Corps, a group of mercenaries that travel the continent doing contract jobs. 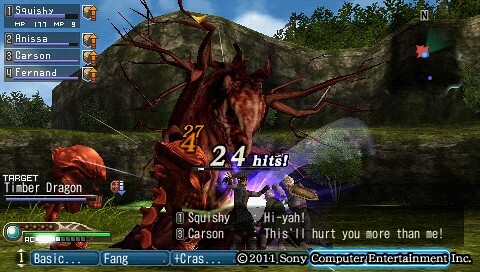 Unlike the PS3 games, Origins has been designed more akin to games like Monster Hunter and Gods Eater. The Mobile Corps' train acts as a central hub where missions can be accepted and where other administrative management can be done, such as managing the new recruits, purchasing items and weapons from the guild and even getting to know the crew a little better. Don't expect any vast overworld to explore or an exceptionally engaging story. This is a portable game and it plays with that aspect it mind. There are two types of missions, Field Missions and Corps Missions. The Field Missions are the ones that push the barebones story forward while the Corps Missions are just like side-quests and will increase your team's affinity for you. Once a mission is accepted, you can pick three other NPCs to form your party. Direct control is limited to your own character, but the AI seem relatively competent and capable of taking care of themselves. Dungeons seem random at first, but after a couple of missions, it's obvious that maps are constantly recycled. The only difference is that each mission starts off in a different section of the map, which affects its orientation, making it look like it's a different map. It's not too big a deal, but the lack of variation becomes seriously noticeable after you've sunk a good number of hours into the game.The battle system is a bit faster than you'd expect, with abilities and attacks mapped to hotkeys displayed at the bottom of the screen. You can cycle through these abilities by using the D-pad. It's not entirely turn-based, but it's not entirely real-time either as each ability has a respective cool-down attached to them, not unlike the combat seen in MMOs like World of Warcraft or Final Fantasy XIV. The combat itself can get rather addictive and the game is pretty open from the get-go, allowing players to choose their preferred weapon types and abilities "“ these can also be changed at any point in the game. Points you earn from each mission can be used to purchase new skills and abilities, which require action points to be performed in battle. Using a standard attack recharges said action points. 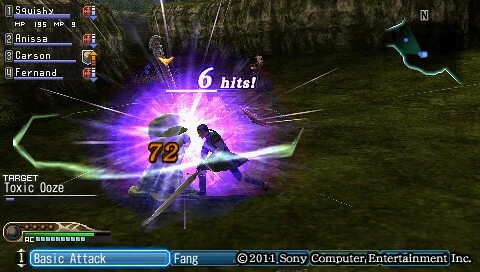 Enemies can be stunned when struck with attacks they're weak against. Finish them off when the stun gauge is nearly empty and Engage Mode will be triggered, boosting experience and loot gained from the battle. It's a pretty fun system and things can get quite intense with the more challenging missions. Cycling through each ladder of abilities can feel a bit cumbersome though and there's little feedback when it comes to consuming items. The cool-down for using items is also quite unforgiving, making it best to time when to use curative items, else you might be felled while doing so. While you can't transform into the White Knight, you can still transform into what looks like miniature versions of it. Crystals called Optimi empowers your hero as well as those in the Mobile Corps. Fill up the Optimus Gauge by completing quest objectives and you can transform into a group of armour-clad heroes. It's quite amusing and the similarities to Power Rangers is uncanny. 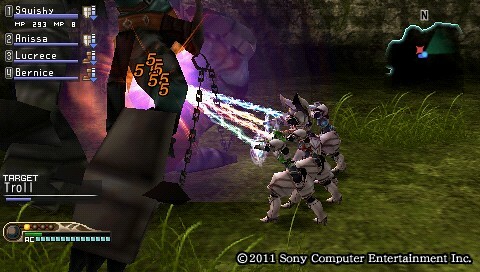 The armour and effects of an Optimus Transformation is also dependant on each party member's Chroma and Form. Each character is assigned a Chroma, essentially the colour of their Optimus and soul, as well as a Form, a status boost that affects the entire party. This Form can be chosen before departing on a mission and they range from increasing critical hit rates to health regeneration and increased Optimus charge rates. Pick a defensive-based Form and your Optimus will transform the party into heavily-armoured warriors. 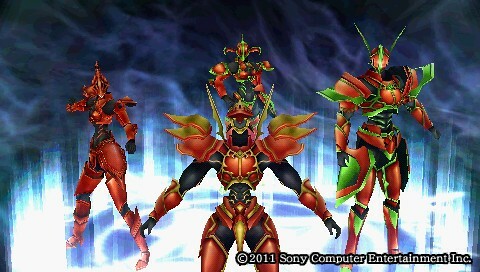 Choose an offensive-based Form and they'll transform into spiky, red troops that resemble Guyver. You'll also have access to special attacks that can be performed when the Optimus Gauge has been charged during transformation. While the game does play relatively well, the presentation seems to be pretty barebones. A large majority of the game is limited to the confines of the Mobile Corps train and mission maps. This isn't entirely a bad thing and works extremely well for dropping in and out when on the go. However, the lack of variation in locations and even mission types is quite disappointing. Most missions will have you map out an area, exterminate X amount of enemies or defeat a boss. It can get extremely repetitive.Like Monster Hunter, the game does let you enhance your weapons and armour, but it simply feels cosmetic. The addicting gameplay makes up for it a bit, but sooner or later you're likely to question why you're even playing through the same missions over and over again. 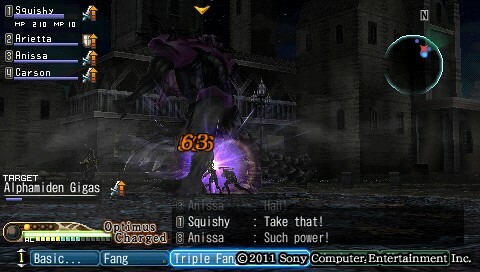 At the very least, the boss-type missions are pretty enjoyable as bosses come in a variety of sizes, from tiny humanoids to massive Gigantes and Knights. What you may find more satisfying in Origins are the Corps Missions. Undertaking these will not only increase the affinity of your allies, but enable you to learn new abilities as well. These missions are generally more challenging as well, with some having a much higher level recommendation than the Field Missions. You're also able to recruit new allies to the Mobile Corps. The opportunity presents itself after almost every available mission, however you can only recruit as much as the Mobile Corps train can fit. Purchasing new carriages will increase the amount of slots available for new recruits. It's fun at first, but it gets to the point when you have a solid group of NPCs and the recruiting gets a bit annoying, seeing as it occurs after every mission. It would've been nice to leave the option to recruit solely up to the player, much like how Final Fantasy Tactics does it, listing prospectives for you to pick instead of tossing a new person at you after every flipping mission. 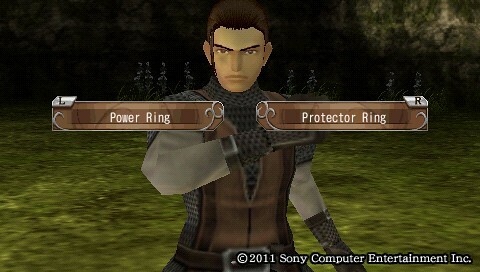 The visuals are pretty standard for a PSP game, but it's the soundtrack that stands out. Some of the string and wind instruments create a very fantastical experience. The mix with contemporary isn't the most convincing, but overall it's a lovely soundtrack. White Knight Chronicles: Origins is a pretty fun adventure. Players will find that they have far more options to play the game as they see fit by creating their own hero and choosing his or her path as well as the companions that will accompany them. The gameplay is addictive, although there isn't much to the world it's set in. Regardless, with the ability to pick and choose your preferred weapon, abilities and companions, it's an adventure worth checking out. Fun and addicting gameplay mechanics. More open in terms of character creation/customization. Not much to plot or story. Recruiting new members can become an annoyance. Lack of variation in terms of the world and missions.